| Fox’s “Rent Live!” No Day But… Yesterday? Fox’s “Rent Live!” No Day But… Yesterday? 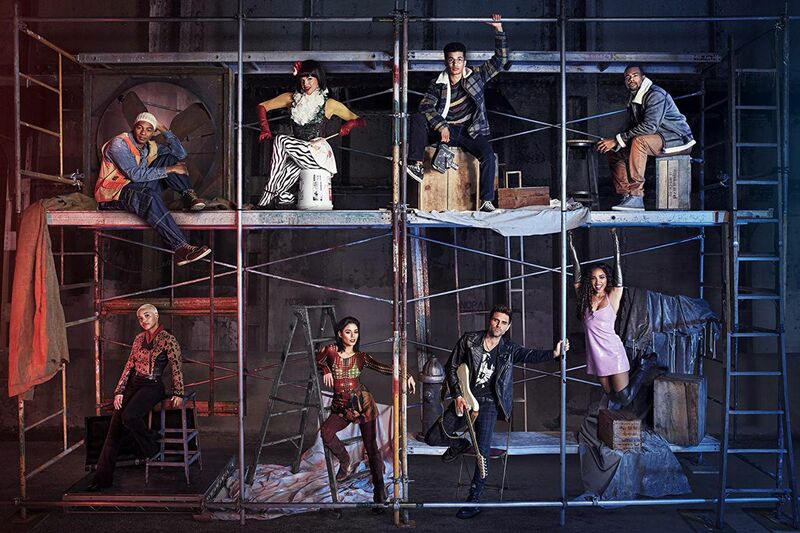 This is the press photo for the cast of "Rent" on Fox. Fox’s “Rent Live!” No Day But… Yesterday? Fox aired the Tony and Pulitzer award winning musical “Rent Live!” to audiences across the country on Jan. 27. Audiences were buzzing with excitement for the “live” show, but were soon filled with disappointment when a “previously recorded” sign popped up at the very beginning of the musical. In fact, almost the entirety of the musical that aired was from the last dress rehearsal in front of a live audience after actor Brenin Hunt, who played struggling musician Roger, broke his foot the day before the live performance. Already off to a rough start, “Rent” continued to struggle with it’s all-too-loud studio audience, blurry and dizzying camera-work, and non-impactful vocals. 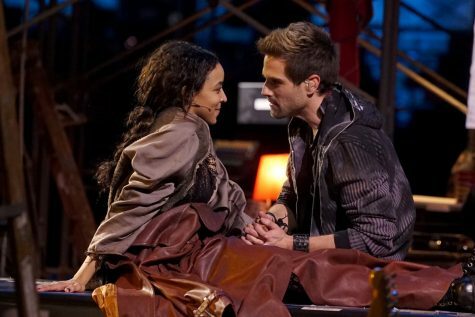 (From left to right) Tinashe and Brenin Hunt play lovers Mimi and Roger in “Rent” on Fox. Quickly, viewers were stuck listening as Fox cut out the more provocative lyrics of the show, not even attempting to save the rhyme, instead putting lousy fill-ins into the show. The most popular song of the show, ”Seasons of Love,” even disappointed audiences by giving the song to the ensemble rather than having the main characters, which gave the song the fame and popularity it has today. The ensemble were not the only ones lacking vocals; actor and drag queen Valentina, who played the energetic and outgoing Angel, could not keep up with the mix of dancing and high vocals that comes with the role and was drowned out by the Broadway acclaimed Brandon Victor Dixon, who played Angel’s lover, Tom Collins. (From left to right) Kiersey Clemons and Jordan Fisher play characters Maureen and Mark in “Rent” on Fox. The true highlights of the show were Brandon Victor Dixon’s chilling version of “I’ll Cover You Reprise,” Vanessa Hudgens and her strong voice as Maureen in “Over the Moon” and Hudgens and Kiersey Clemons’ roof-shattering rendition of “Take Me or Leave Me,” along with an appearance of the original Broadway cast at the end. The creator of “Rent,” Jonathan Larson, made the musical to show the world the impact of life without love and just how much of an impact we make in each other’s lives; the show is meant to be provocative, to curse, to show things that TV would ban-that’s what makes the show so great. Turning “Rent” into a live musical on TV was never going to be good. What is so upsetting is that thousands of people were introduced to “Rent” for the first time through a censored version that dulls the meaning and impact of the show. 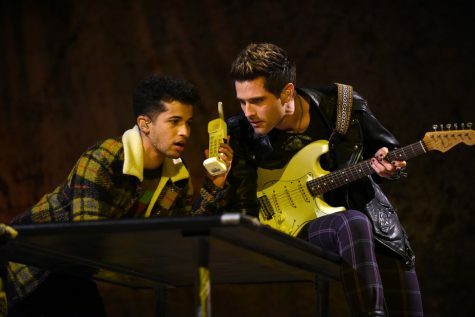 “Rent” should be experienced for the first time just as Larson wrote it with cursing, sexual innuendos and all; it should have the rock of the show blasting throughout a theatre with actors who know their characters and portray them perfectly and the pure, raw emotion Larson intended “Rent” to have. Don’t take “Rent Live!” on Fox as an understanding of what “Rent” is; see it live, and actually live. 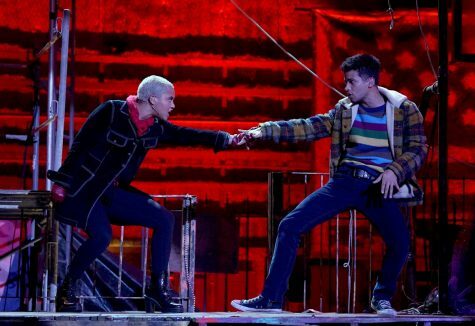 (From left to right) Jordan Fisher and Brenin Hunt play struggling artists Mark and Roger in “Rent” on Fox.